Here’s Mars like you’ve never seen it before. From Martian dunes and dust devils to incredible craters and even a photo of NASA’s recently-landed InSight mission, a treasure trove of images taken by Europe and Russia-operated satellite currently orbiting Mars has just been released. What is the ExoMars orbiter doing? 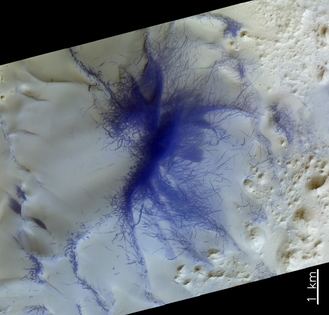 The ExoMars Trace Gas Orbiter, at Mars since October 2016 by the European Space Agency (ESA) and Russian space agency Roskosmos, is actually looking for methane, but it’s also taking some fantastic images using its CaSSIS (Colour and Stereo Surface Imaging System) camera. One image even features NASA’s InSight lander, which landed on Mars on November 26, 2018 to study the interior of the planet. It’s the first time a European instrument has identified a lander on the Red Planet. InSight is on the Elysium Planitia region of Mars. The ExoMars Trace Gas Orbiter (whose Schiaparelli lander crashed on descent in 2016) is actually only one part of a much bigger mission. Another part of ExoMars is a platform on the surface of Mars that will see a six-wheeled surface rover drill for rock samples. It will also have a panoramic camera and a close-up camera. In that way, it’s a little like InSight, which is currently trying to bore holes in the Martian surface. The ExoMars rover is called Rosalind Franklin, after the DNA pioneer. It will launch in 2020 and arrive at Mars in 2021. Is ExoMars working with InSight? TGO will also act as the data relay for the ExoMars rover when it arrives at Mars in 2021. You can find the complete showcase of all of the ExoMars orbiter’s images here.